The beautiful Miss Amelia Snow is not accustomed to being snubbed by the gentlemen of the ton. But when her mother dies unexpectedly, forcing Amelia to take employment as companion to a wealthy cit's daughter, she quickly learns to play down her looks or risk losing her position. When her employers, the Smithsons, decide to throw a country house party, she is determined to fade into the background. But how can she when the Smithson's guest of honor is Lord Quentin Fortescue, the childhood friend who stole her heart? Younger son, Lord Quentin Fortescue, is far more interested in his host's cotton mills in the north than he is in courting the man's dim-witted daughter. But it's the girl's companion who makes him look twice. Years ago, Miss Amelia Snowe rejected his proposal without a backward glance. Quentin has molded himself into just the sort of man she'd have wanted back then, but is Amelia still the smug beauty who broke his heart? And can either of them risk their newfound positions to indulge the fiery attraction that burns between them? 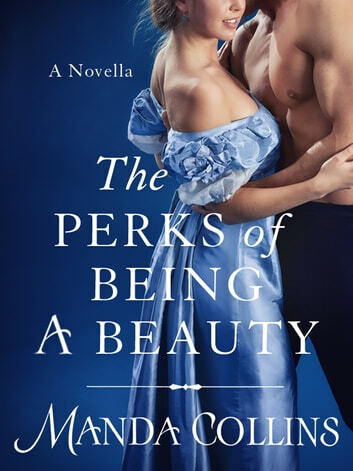 The Perks of Being a Beauty is an Ugly Ducklings book from Manda Collins.